Ancient god-fearing people imagined hell when they passed Shojingaike pond, located on the roadside of Route 1 near Ashinoyu, because of its isolation and the view of the steaming mountain behind the pond. In the 12th century, people inscribed Buddha images on the rocks by the roadside to pray for the safety of travelers on the highway. 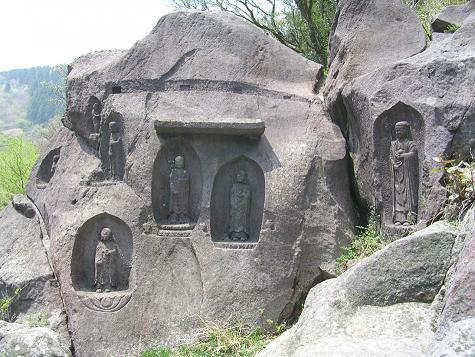 The rocks, which are lavas(※１） of Hakone volcano, were favored for such stonework by the ancient people of the Tokyo area, starting with Kamakura. ※１　lava:We call Lava when magma reaches the surface and flows without being scattered in pieces.Both hot liquid form and solid form after cool down are called lava.